Our recent Outback Queensland road trip confirmed yet again how much we love taking road trips. It’s our favourite way to travel as a family, and nothing beats the freedom and adventure of packing the kids up in the car and hitting the open road! 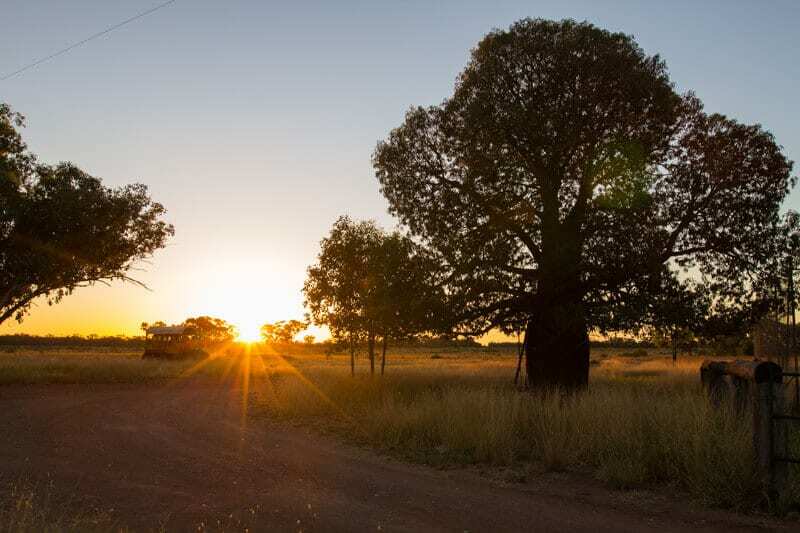 As we mentioned, we love Outback Queensland as a road trip destination and how the landscapes, the history, the culture, the people, the stories and the space keeps us coming back for more – it gets under your skin! Outback Queensland deserves more than the 12-days we explored, but I’ve put together this itinerary so that you can replicate the trip we’ve just done – feel free to expand or shorten your journey. These are not only our tips, but insider tips from the locals in each town and from our online community. They shared with us the best things to see and do between Roma and Winton. We set off from our home on the Gold Coast to start our Outback adventure in Roma, the gateway to Outback Queensland for us. 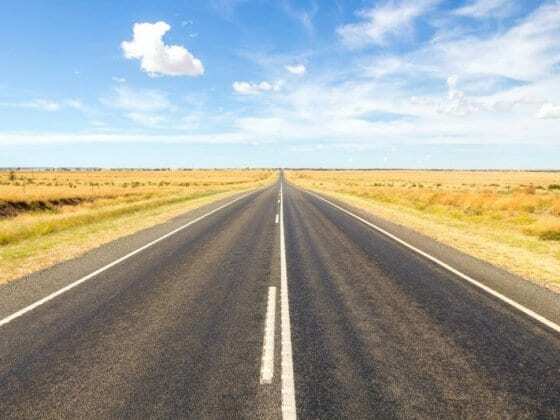 It was a six-hour drive to Roma, but we took out time with pit stops in Toowoomba and Chinchilla, and other than this first day no other drive between towns was longer than 2.5 hours – the Outback is spacious, but it’s not that spread out! The best way to experience Outback Queensland is a self-drive, and I hope you find this guide useful. I’ve broken each destination into things to see and do, places to eat and drink, and where we slept at night. After arriving in Roma, I recommend you overnight at the Roma Central Motel, one of the best regional motels we have stayed in anywhere. Modern, free wifi, free breakfast pack, family rooms, friendly owners and centrally located. For dinner in Roma, the family friendly White Bull Tavern introduced us to the big and hearty steaks you can expect in this region, and the kids will enjoy drawing all over the white paper tablecloths. Grab an early breakfast at the Tasting Co and then spend the day getting to know Roma. Did you know that Roma was the first place in Australia to discover gas and that it happened accidentally when a drilling crew was boring for water? We didn’t until we learnt all about it at The Big Rig. 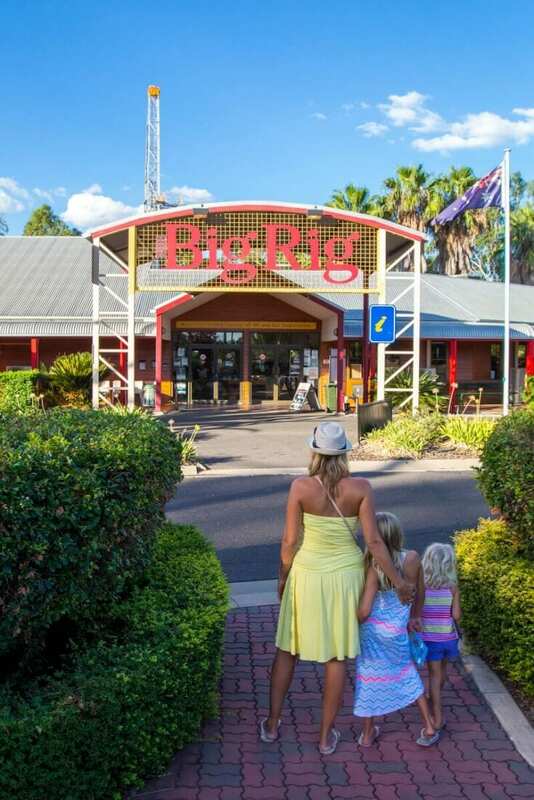 The Big Rig is an interactive and fun place to bring your kids and our self-guided tour took us on a journey through the history of oil and gas in Australia – I think we learnt more about gas here than in all of our school years. There’s an onsite cafe too that serves yummy desserts! 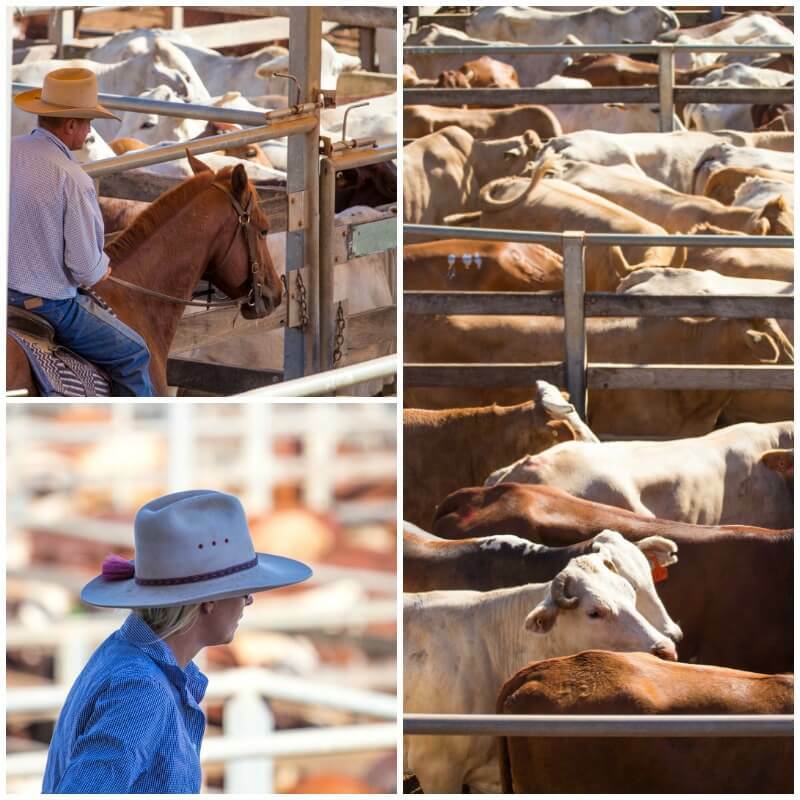 The Roma Saleyards is the largest cattle selling centre in Australia and the largest in the Southern Hemisphere. Wow, when you consider the size of Australia and our cattle industry, that’s saying something! We missed out on witnessing the auction in the morning – held Tuesdays and Thursdays at 8.00am – which I can only imagine is quite thrilling with the sale of up to 13,000 cattle! But we watched them getting weighed instead which was still an interesting behind the scenes experience for city folk like us! 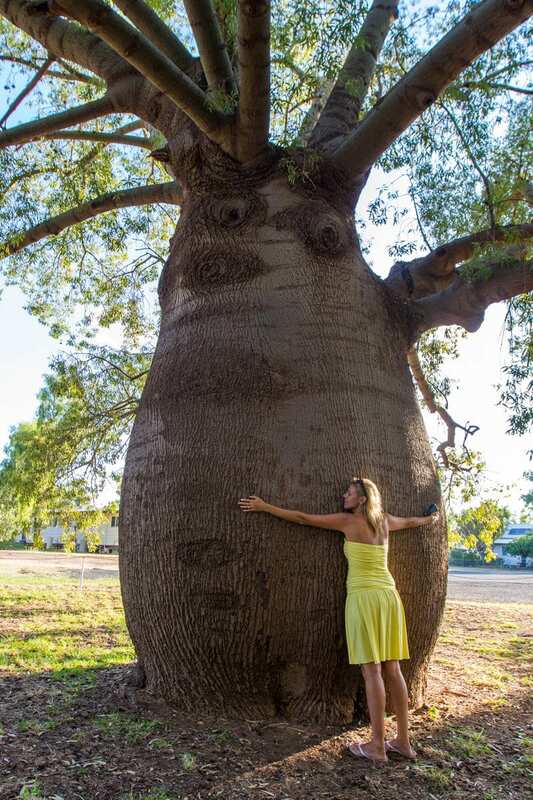 Now these trees are cool, and we found the biggest bottle tree in Roma! Measuring 9.5 metres in circumference, Caz tried wrapping her arms around this baby but didn’t come close. Apparently, it takes six men hand-to-hand to cuddle it completely. 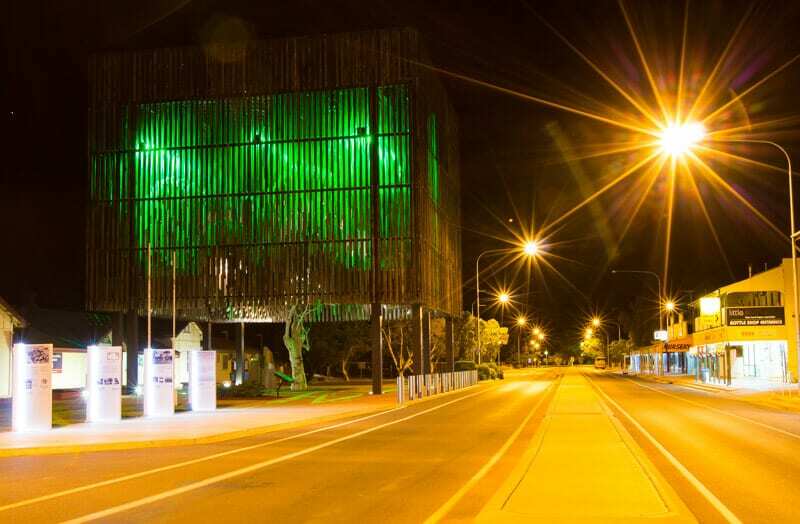 Check out Hero’s Avenue which features 140 bottle trees all paying homage to a local soldier who lost his life in WWI. For our second night, we headed to Bonus Downs Farmstay and I suggest you depart Roma by 3 pm to get there before sunset. The drive is about 1 hour 45 minutes on the Bollon Road with bitumen all the way to the entrance. We left Roma a little later and caught this magnificent sunset on the drive in. You can take us away from the Gold Coast, but we’ll still find the GOLD. 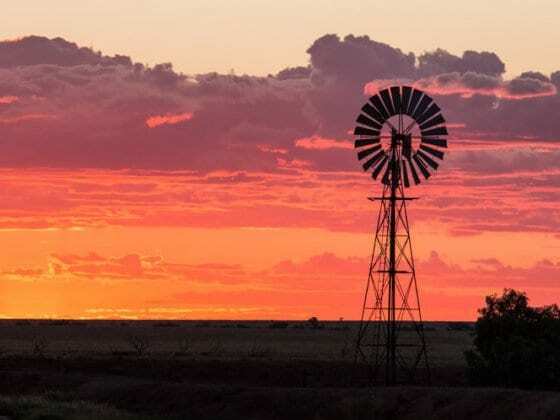 Bonus Downs is a privately owned property run by friendly locals Madonna and Lyle and the Outback Queensland road trip experience you’ve been looking for, a place where you can enjoy good old fashioned country hospitality and disconnect from your gadgets and reconnect as a family. Enjoy a welcome drink and nibbles at sunset by the dam, and then a delicious home-cooked meal out the back under the stars in The Smoke House. Wake up to a brilliant sunrise and fresh country air as you sit on the verandah with a hot cup of tea or coffee. In the driveway is a magnificent bottle tree as foreground as the sun rises in the distance. 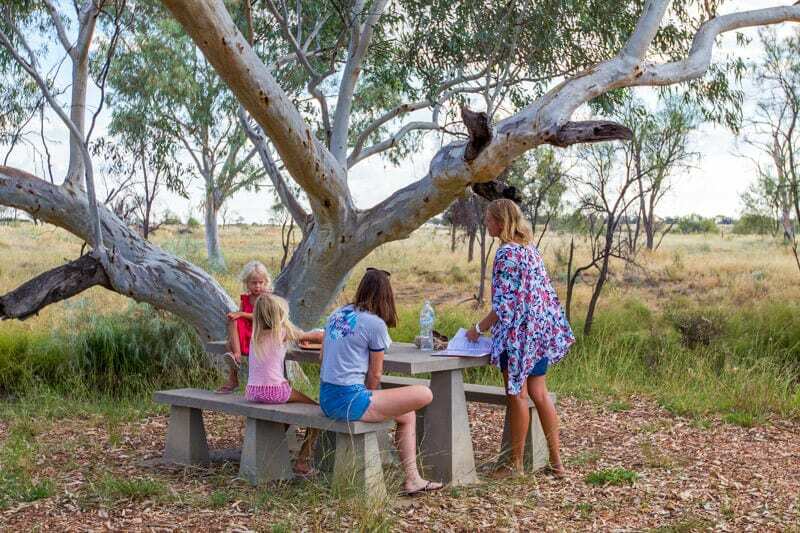 Madonna cooks a lovely breakfast in the main homestead, and once your tummy is full, and your head full of stories take a gentle stroll around the property or a bush walk taking in the history and atmosphere of the Outback. If you’re up for a paddle, you can do that on the dam in the beautiful morning light with black swans as your company. And it wouldn’t be a farm stay without a horse ride and a spin around on a motor bike – thanks, Lyle and Johnny! We only spent one night at Bonus Downs, but I think it deserves two nights to appreciate the property. Let the kids run around, sit on the verandah and read, go bush walking and sit around the campfire at night time and star gaze and enjoy the serenity. We slept in the rustic Jackeroos Quarters, and camping is also available in the shearing shed or bring your tent. Caravans, motorhomes, and campervans are all welcome, powered sites and water is available. Depart Bonus Downs and head to Charleville (approx. 180km/2.5 hours drive time) via Mitchell (48kms from Bonus Downs). In Mitchell, stop for an hour at the Great Artesian Spa and enjoy a relaxing and soothing 39-degree artesian spa. There are two large pools of artesian water. One naturally heated from the Great Artesian Basin designed to revitalize both body and mind, the other pool is for those who prefer a cooler experience. Hot AND cold treatment is the go! Afterward, grab a coffee from the bakery in town and head off to Charleville. Charleville has enough activities to warrant a two-night stay with plenty of daytime and evening of activities. 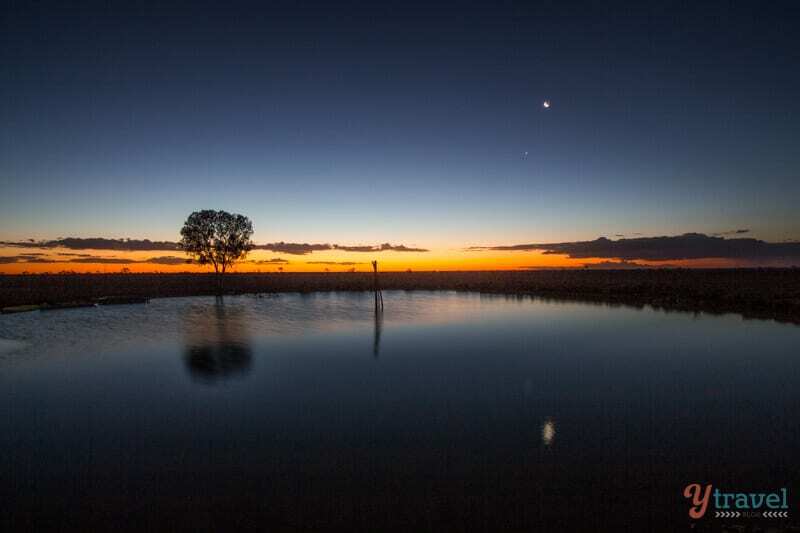 Cosmos Centre – an Outback Queensland road trip must do. 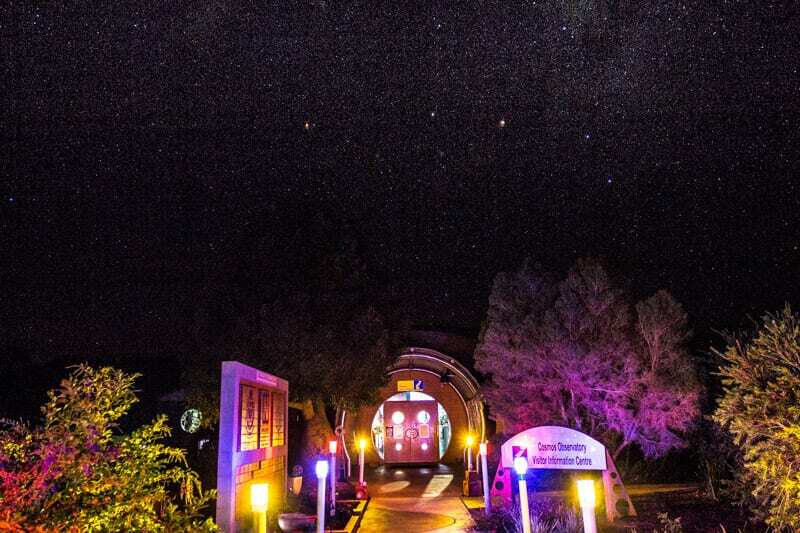 Star gazing at the Cosmos Centre in Charleville is a must do on an Outback Queensland road trip. We’ve been twice now, and it’s been amazing both times, in the day and night. 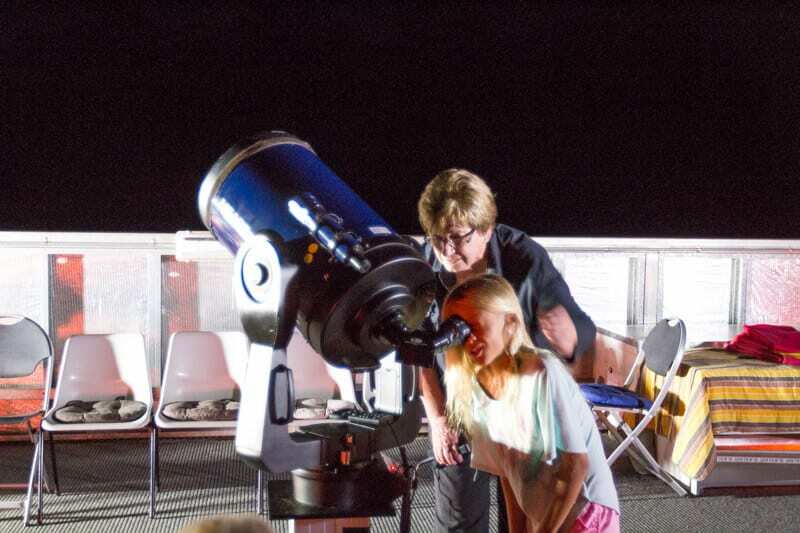 There’s just something special about looking at the moon, the sun, and the stars through powerful telescopes, especially a big thrill for our kids. Charleville is the ideal place for stargazing due to lack of light pollution and a low horizon, combined with the perfect latitude makes for the perfect conditions. You can read about this stuff in books, but we love giving our kids hands-on learning experiences. Our kids loved getting up close and personal with an endangered Bilby. They’re doing a great job with the Bilby experience to help educate us and help this iconic little Australian. We were in town just as the new centre was opening at the railway station. 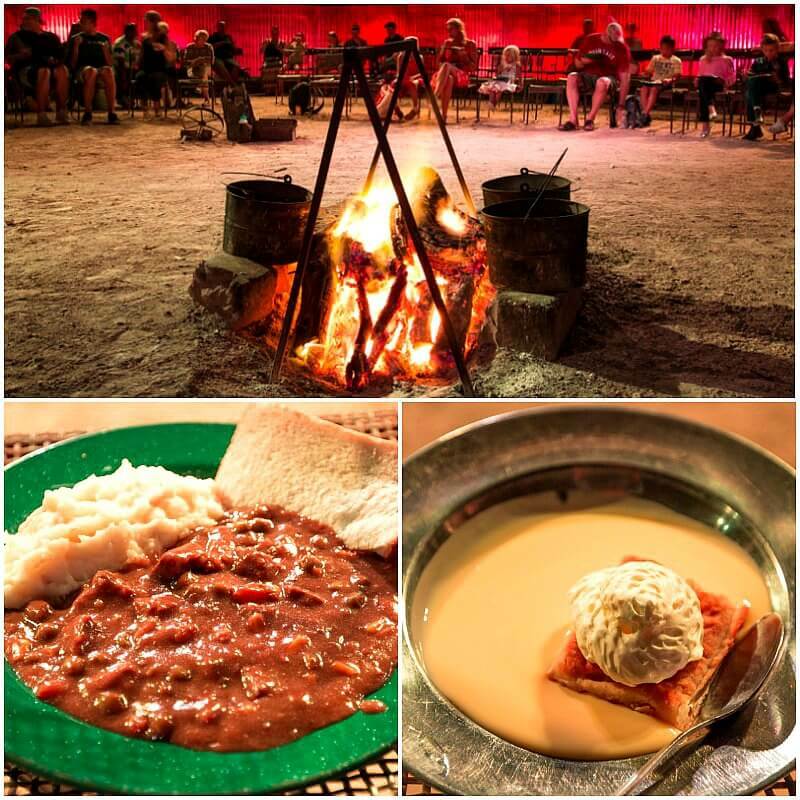 The Bilby experience is only open from April to mid-October on Monday, Wednesday, Friday and Sunday nights. 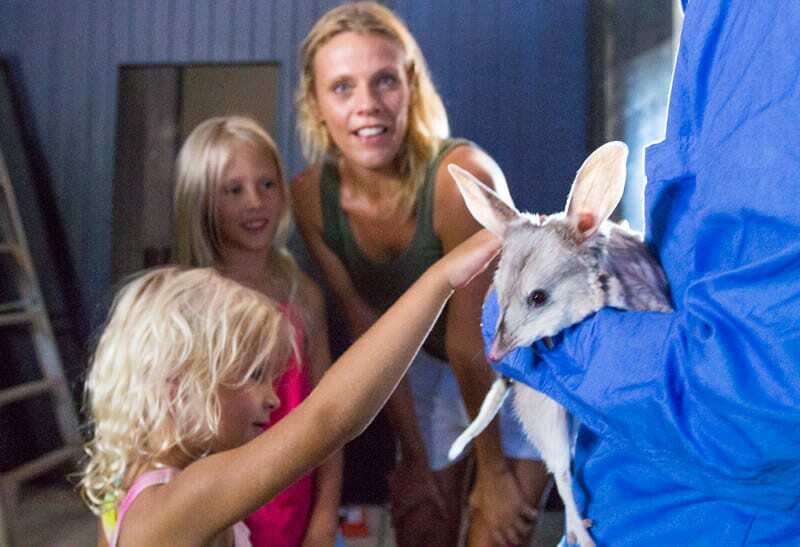 The Bilby Centre is now open 7 days a week with ‘Up Close and Personal’ tours 5 days a week. We did a tour of this historic pub and learnt about its fascinating history and highly recommend it. Just one cool fact is that it has the longest bar in Queensland – come grab a pint! There’s a lovely view of the town from the balcony and you finish off the tour with delicious scones and billy tea. 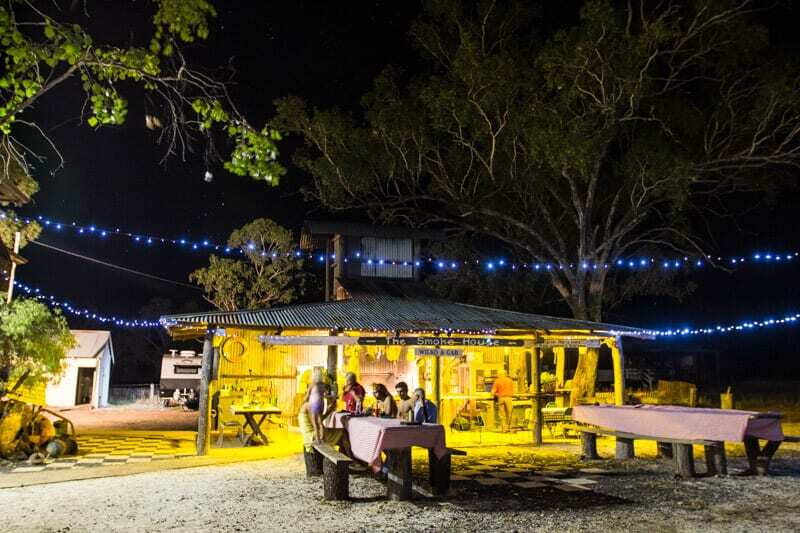 It’s hard to beat cooking over a campfire and at the Bailey Bar Caravan Park, they are known for their legendary camp oven dinner. On the menu: red wine stew, hot apple crumble, damper & billy tea – served Wednesday, Friday and Sunday nights – and timed to allow you to go to the Cosmos Centre Observatory! On a previous visit to Charleville in Outback Queensland, we did this war convoy tour and found it fascinating. Who knew that Charleville Airport became part of the USA in 1940 when the site was handed over to the US Military as a top secret site during World War II? The area was a village in its own right with over 3,500 United States Servicemen in the area. Many of the sites have been uncovered, and you can join in for a guided tour. Bookings are essential and can be made at the Charleville Visitor Information Centre. Another educational experience for the kids in town is watching the weather balloon being released. And find out how meteorologists predict the weather by visiting the Charleville Bureau of Meteorology. 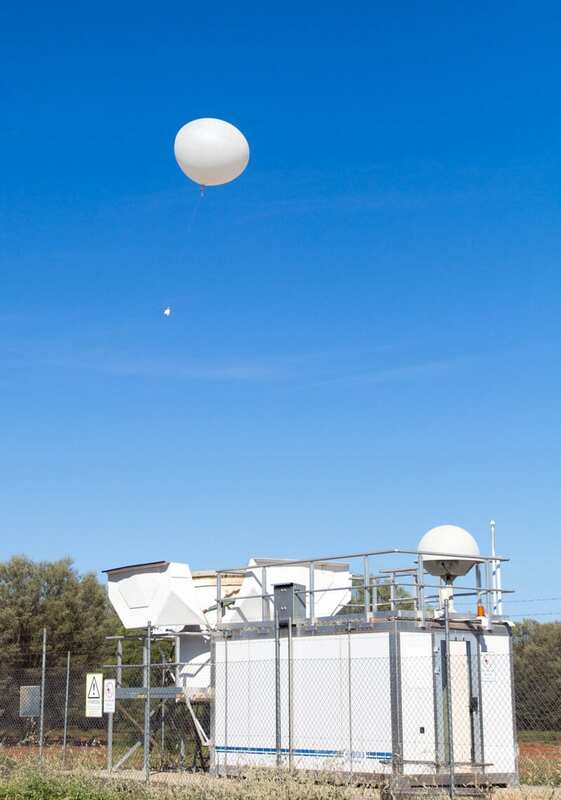 You can enjoy a guided tour with a Meteorologist or simply observe the automated process of the balloon release. Heinemann’s Country Bakery – Good bakery. Good coffee. Black Sheep Cafe – Good coffee. Healthy options. Blue Gum Cafe – Good burgers, focaccia’s, sandwiches. RSL – Good for families and larger groups. Hotel Corones – typical pub grub. The Rocks Motel offers city style accommodation and country hospitality with 20 modern and stylish rooms, and being centrally located right in town makes for an easy stroll to the main shops and cafes. They also have an on-site restaurant. Enjoy a lazy breakfast in Charleville then plan to arrive in Tambo for lunch, approx. 201 km/ 2.5 hours drive time. On the way take a 10-minute toilet stop in Augathella and check out the Meat Ant Sculpture. Why name a park after a meat ant? Augathella’s football team known as the mighty Augathella Meat Ants were fearless in their attack against their opponents, which earned the town the nickname…”MEAT ANT COUNTRY”. 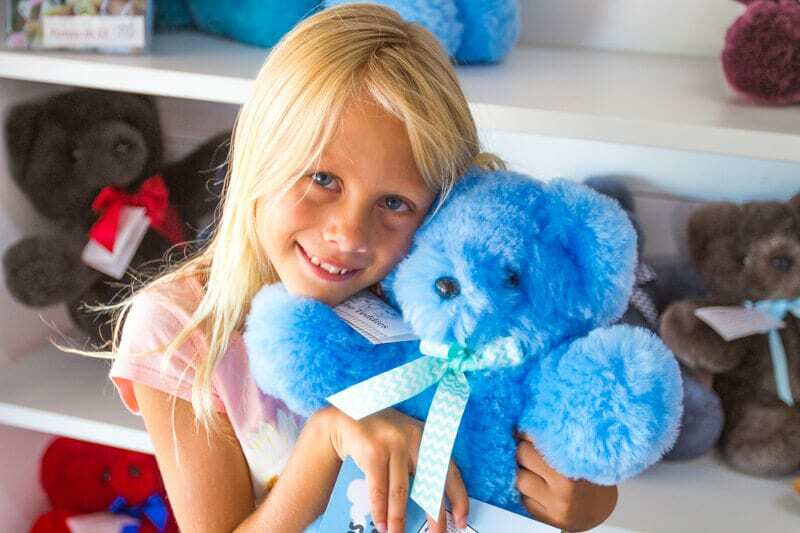 In Tambo, stop in at Fannie Mae’s Cafe for lunch then head to the famous Tambo Teddies and see the handmade woolen bears be cut out and sewn, as well as cuddle the bears on the shelf whilst learning the origins of Tambo Teddies. Each teddy is created from 100% woolen sheepskin, truly an Australian hand-made product and over 38,000 teddy bears have been made here, and yours will have its unique number and personality. Tambo Teddies was created by three ladies who wanted to create jobs for the town and new industry. 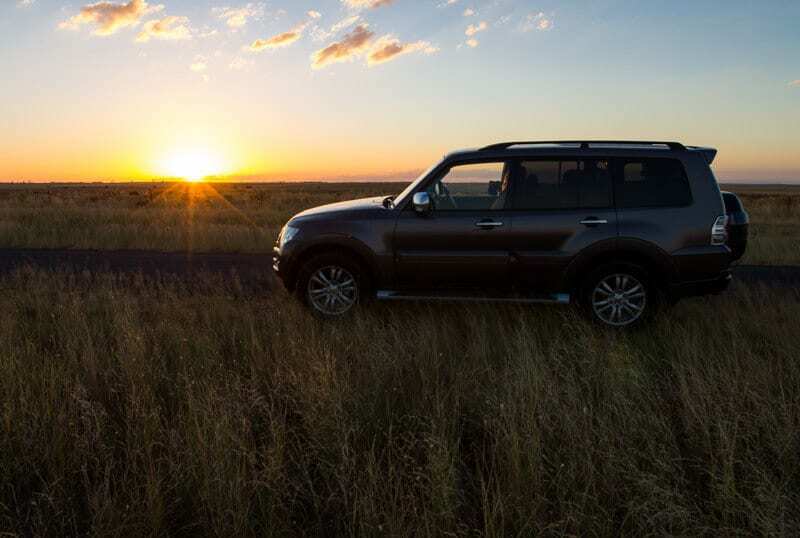 We love the spirit of the Outback! 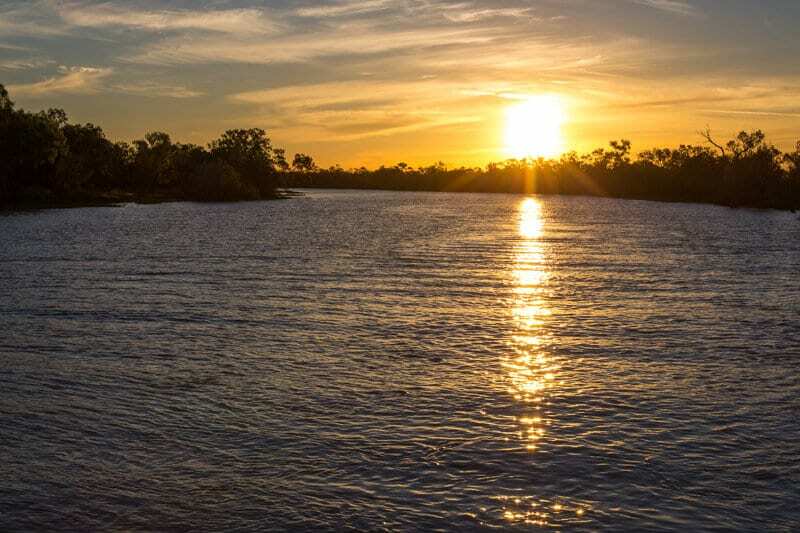 Other options in Tambo include the Coolibah Walk located along both banks of the Barcoo River, the Post & Telegraph Museum, and the Grassland Art Gallery. Depart Tambo mid afternoon for Blackall (102kms / approx 1 hr) and overnight at the Acacia Motor Inn. 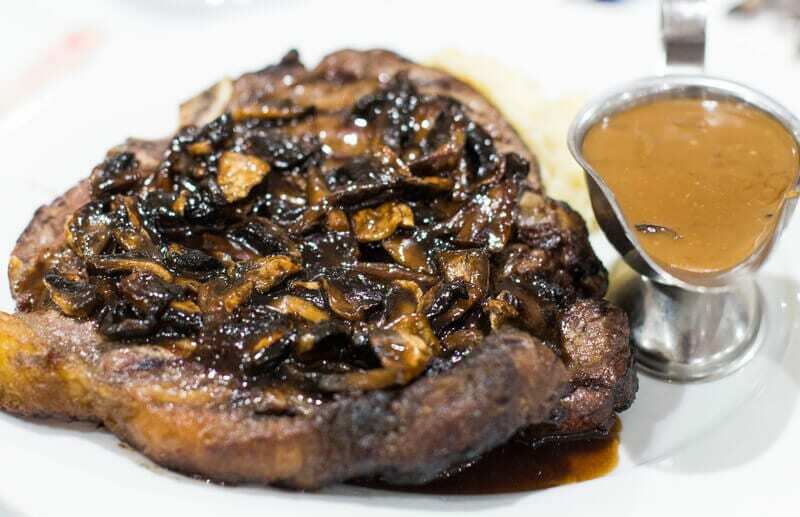 Enjoy a hearty steak and huge portion of veggies for dinner at the Barcoo Hotel. In the morning grab a coffee at the Drawing Board Cafe, tell Holly that Caz & Craig sent you, then visit the historic Woolscour and learn about wool scouring – how they clean the grimy wool. Blackall is Merino Country, and wool is a very important industry in our country. It was a fascinating tour as we learned of the vital role of wool scouring in Australia. More great hands on education for the kids! Open seven days a week for personally guided tours, on the hour, every hour, with the first tour commencing at 9.00am. 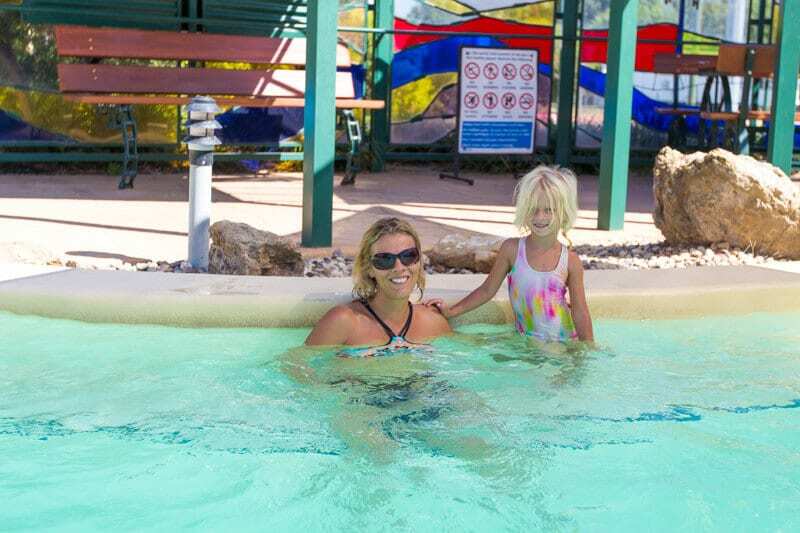 Others things to do in Blackall include the popular Blackall Aquatic Centre where you relax in a warm and naturally fed artesian spa, the Black Stump, and the Jack Howe Memorial Statue. At midday depart Blackall and head for Lara Wetlands, 78kms North of Blackall on the Landsborough Hwy, look for the Yellow & Black Lara sign! 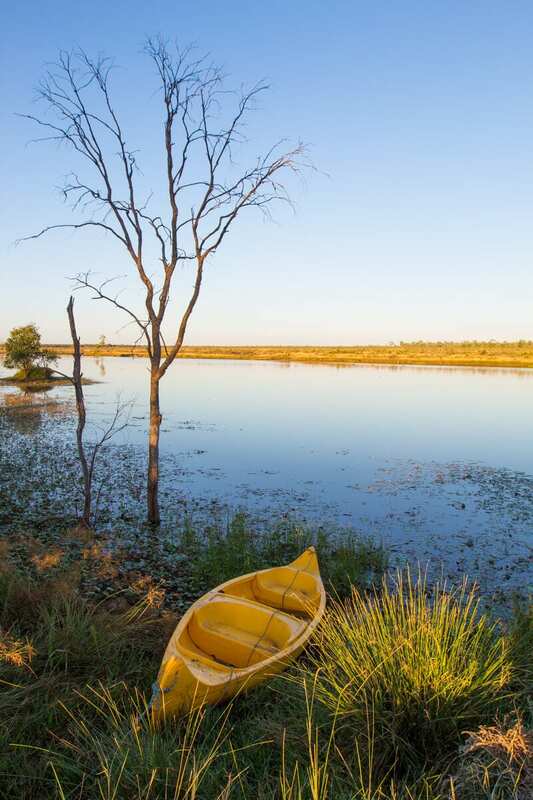 One of our favourite finds on this road trip was Lara Wetlands and a must visit on your drive between Blackall and Barcaldine. 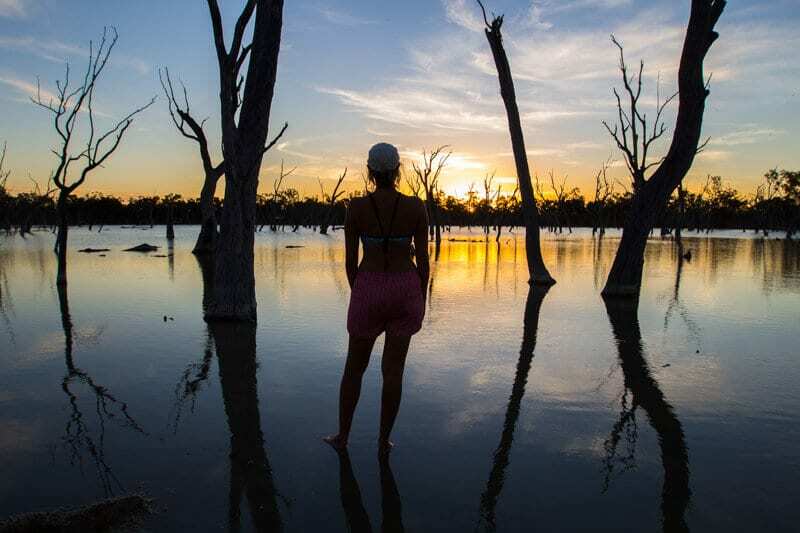 The Lara Wetlands is incredible, a tranquil bush camping site surrounded by wetlands and birdlife and a thermal pool. 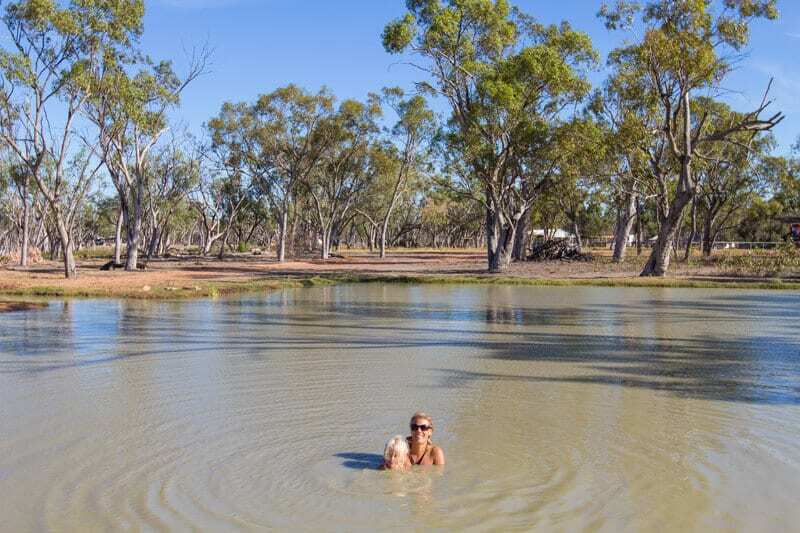 We loved all the trees scattered throughout the water and cooling off in the “cool pool”, an awesome spot to have a swim and a bit of a cleanse by grabbing some mud from the bottom and rubbing it on your skin – nature’s bath tub at its best. 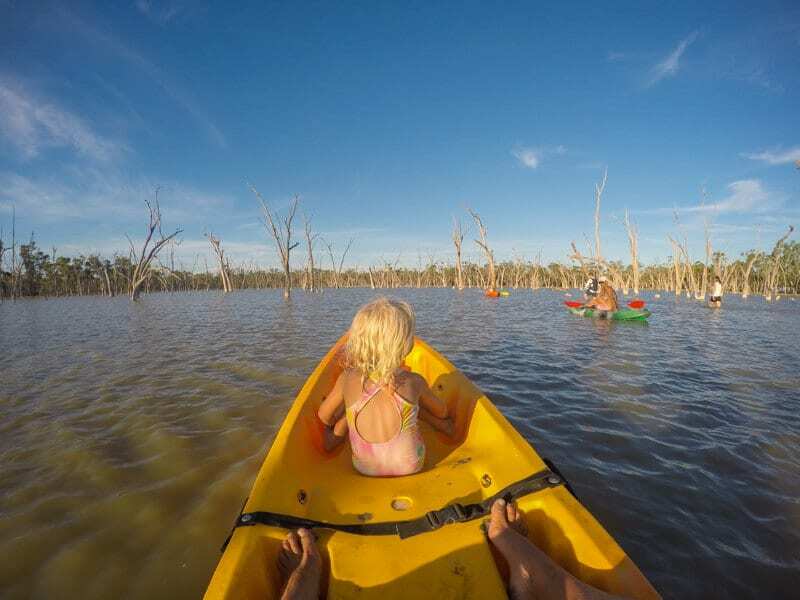 The best way to take in Lara Wetlands is by kayak. We weren’t set up to stay the night but hung around as we heard the sunsets are pretty special here – they weren’t lying – such a beautiful and unique place in Outback Queensland! If you have a caravan or camper trailer or tent, you can stay overnight. No powered sites but generators welcome in designated area. Just be warned, caretaker Bill stopped in for a few nights, and two years later he’s still there. Say g’day to Bill for us! We departed for Barcaldine as soon as the sun went down – a 28km drive – just be careful driving at dusk especially for kangaroos jumping across the road! We overnighted at the Barcaldine Country Motor Inn. For dinner, there are plenty of pubs in town, and we enjoyed a meal at the family friendly Shakespeare Hotel. After dinner, take a short walk outside and see the impressive Tree of Knowledge all lit up. This big green sculpture was originally a real tree (a 200-year-old ghost gum) and regarded as the birthplace of the Australian Labor Party (ALP). This was because the town was the headquarters of the 1891 Australian shearers’ strike where policy and decisions were made. For breakfast in Barcaldine, we highly recommend the Ridgee Didge Cafe, run by the lovely Cheryl. 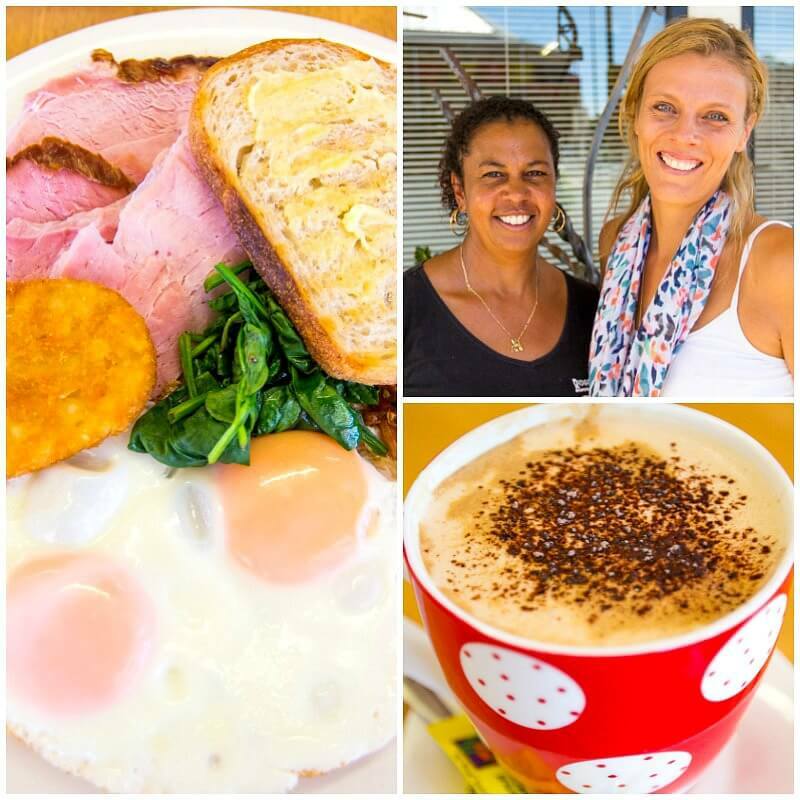 She created her coffee blend “Coolamon” which we highly recommend you order a mug of, and my ham and eggs dish hit the spot very nicely! After brekkie explore the Australian Workers Heritage Centre. 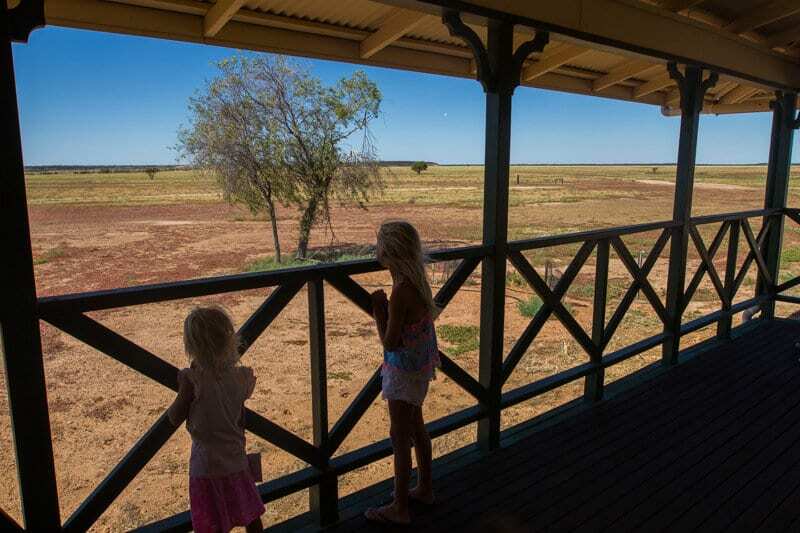 We’re always surprised how good museums and heritage centres are in the Outback. We’re not typical museum people, but this was another one worth an hour of our time. 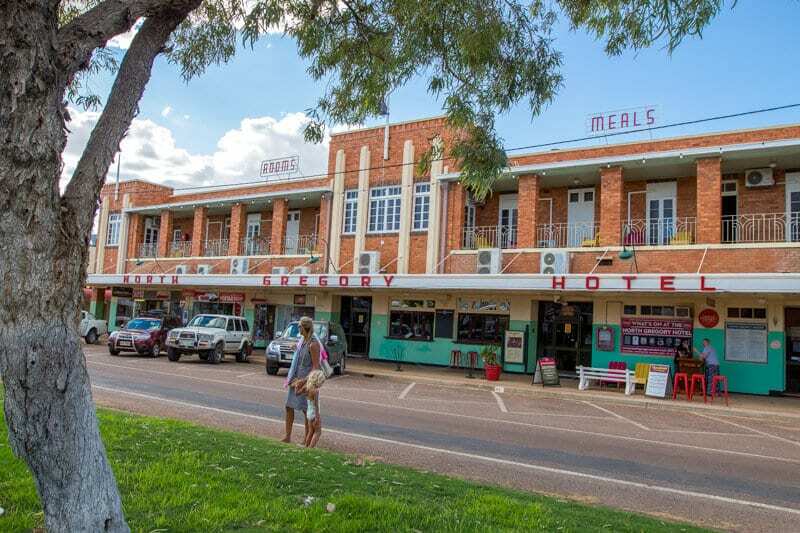 Depart for Longreach (107kms) and time your drive to stop in the town of Ilfracombe for lunch and a cold beer at the Historic Wellshot Hotel. We’ve visited a lot of country pubs on our 18-month road trip around Australia, and The Wellshot is one of those unique outback pubs. Over one hundred years old with a remarkable collection of hats, cash on the roof and local memorabilia. From Ilfracombe, Longreach is an easy 20-minute drive. 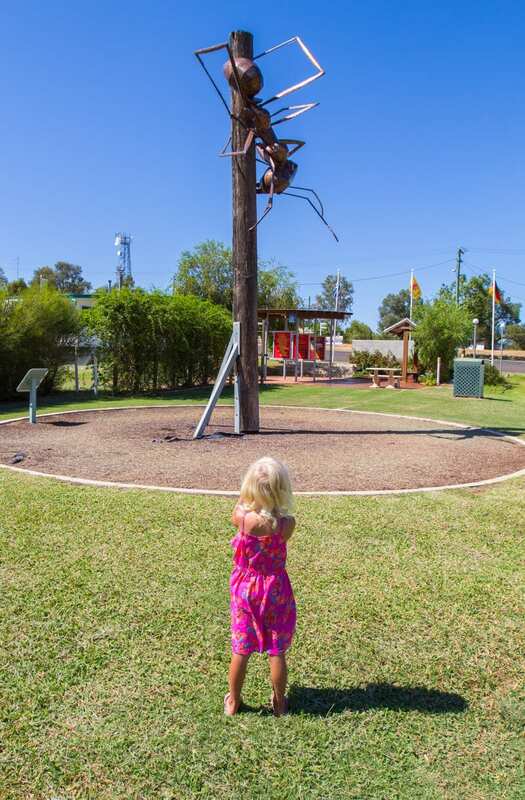 Longreach is also worth a two-night stay with plenty of activities for all family members. 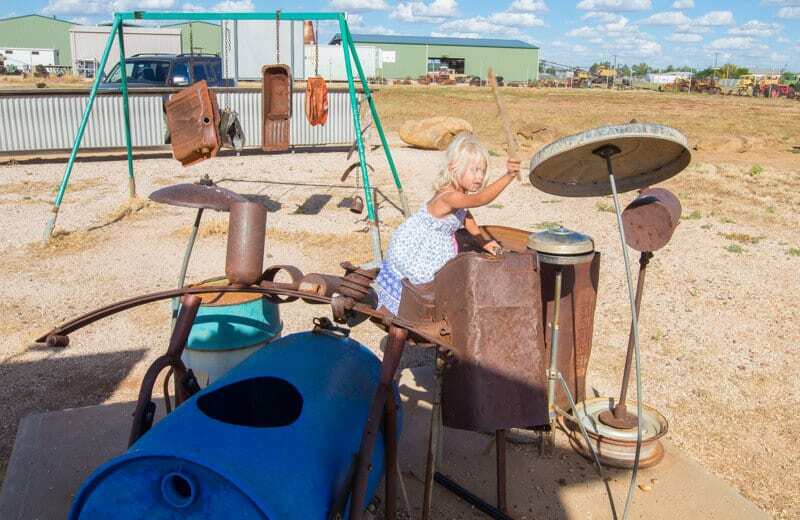 A must do in Longreach is a tour of the Qantas Founders Outback Museum, celebrating its 20th anniversary in 2016. Is there a more iconic Aussie brand known around the world than the flying kangaroo? Our kids had a ball in the cockpit of a Qantas 747. We did a tour of the 747 and two other planes plus the museum and hanger. 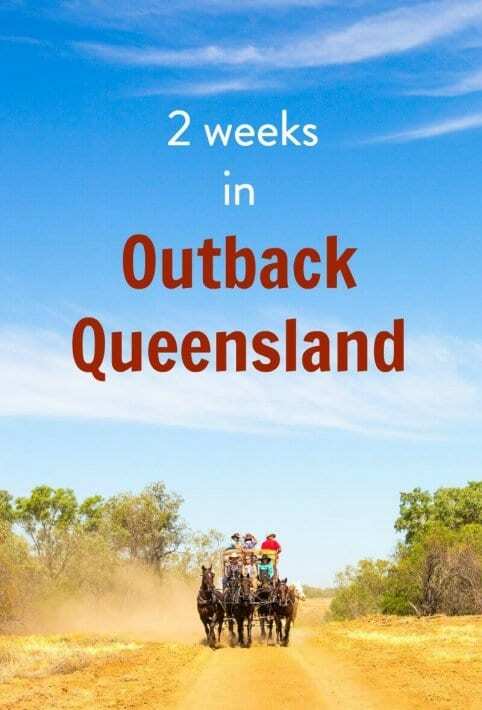 Outback Queensland delivers another fascinating story and history of Australia. 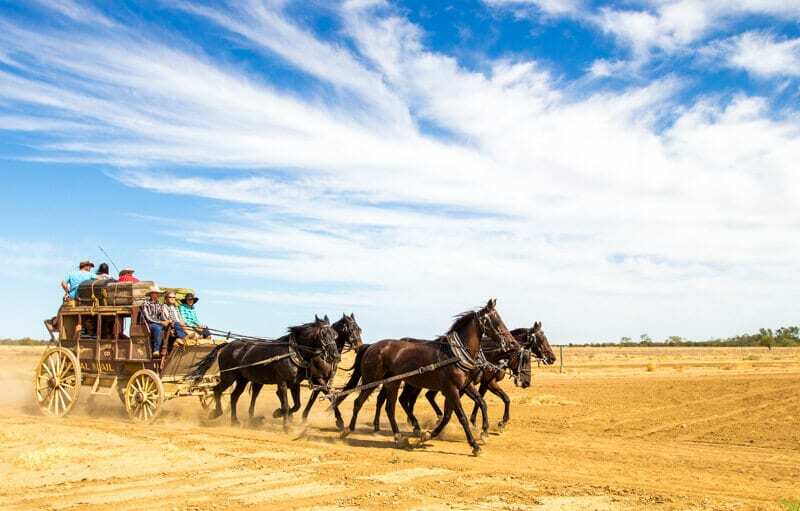 Cobb & Co were the pioneers of stagecoach travel and mail services throughout Australia, and re-enacting this in a restored stagecoach on the Cobb & Co Stagecoach Experience along a stretch of the original Longreach-Windorah mail route was a lot of fun. After the ride, slow down with a traditional smoko (the original Aussie tea break), and a classic Australian movie in retro cinema seats or view the Harry Redford Old Time Tent Show – Aussie outback humour at its best – Kalyra and I couldn’t stop laughing. Click play to see more of the Cobb & Co stagecoach ride. What about that white horse! We enjoyed a lovely sunset cruise on the Thomson River followed by dinner around the campfire on the banks of the river. On the menu: beef stew, apple pie and custard, billy tea & damper, and some bush poetry. To cap off the night, we learned about Harry Redford, otherwise known as Captain Starlight, a hustler who stole over a thousand cattle from Bowen Downs and ran it all the way to South Australia, in the new Starlight’s Spectacular Sound & Light Show. A great family evening. 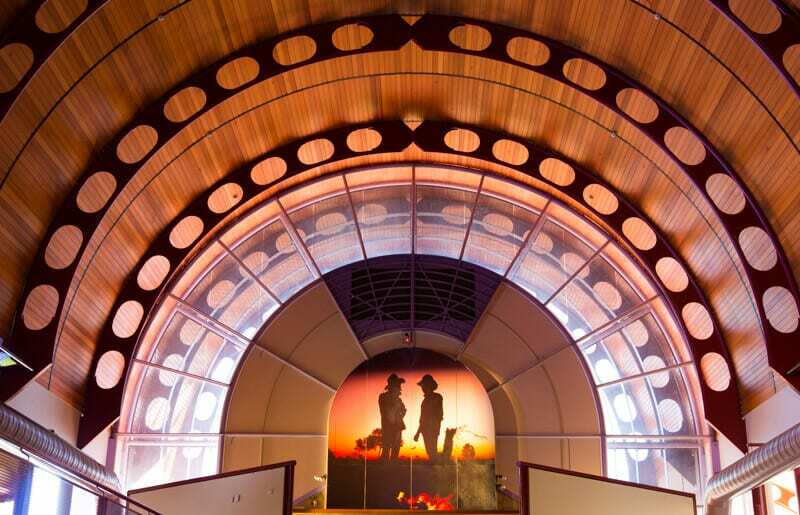 The Outback is the heart of Australia and the Australian Stockman’s Hall of Fame, and Outback Heritage Centre is dedicated to the story of these unsung heroes, the pioneers, the men, and women who opened up outback Australia. We take our “Akubra” hat off to them for the role they have played in Australia’s history, and it’s great to see the role of Aboriginal stockmen acknowledged as well. Impressive building too! 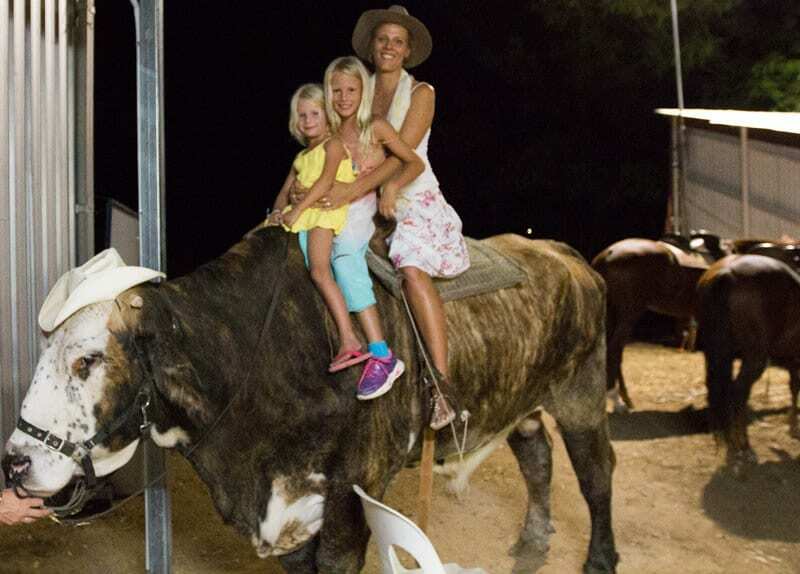 Between April and October, you can catch the Outback Stockman’s Show, which tells the story of real life stockmen and women who work on the land. Be entertained by a singing cowboy on horseback and if you’re lucky like Caz, you’ll be pulled out of the crowd to race a horse in shuttle sprints. 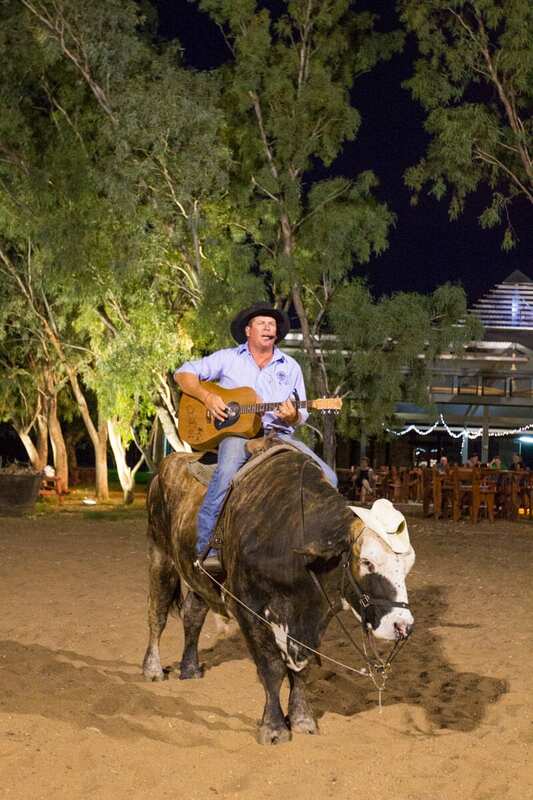 Come and meet a real Stockman and the kids will love meeting his animals after the show, and to satisfy your hunger a spit roast meats and vegetable dinner is on the menu – this is how they entertain you in Outback Queensland! 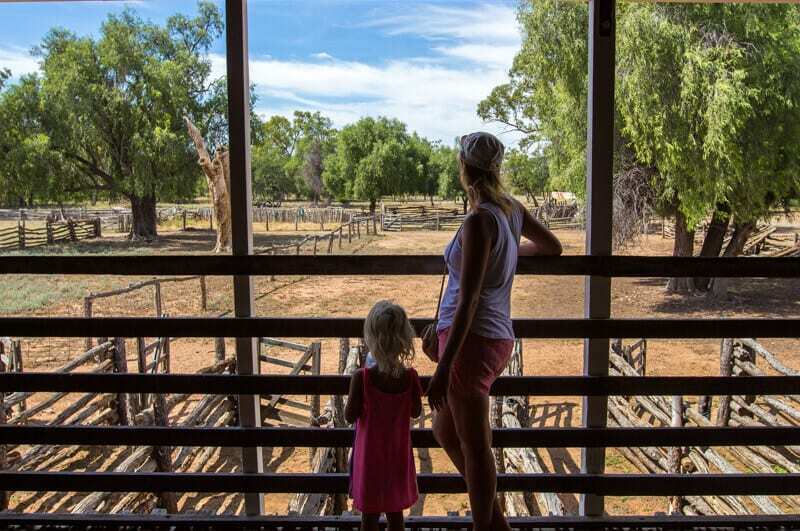 We didn’t visit Camden Park on this trip but on our previous visit to Longreach we met the Walker family and visited their property that once hosted the Queen and Prince Phillip. Walk through the historical Homestead Gardens, Shearing Shed, Cattle Yards and finish your visit off with sunset drinks around the dam. We never made it to Starlight’s Lookout, we took the wrong road, but it came highly recommended as offering great views of the surrounding area. 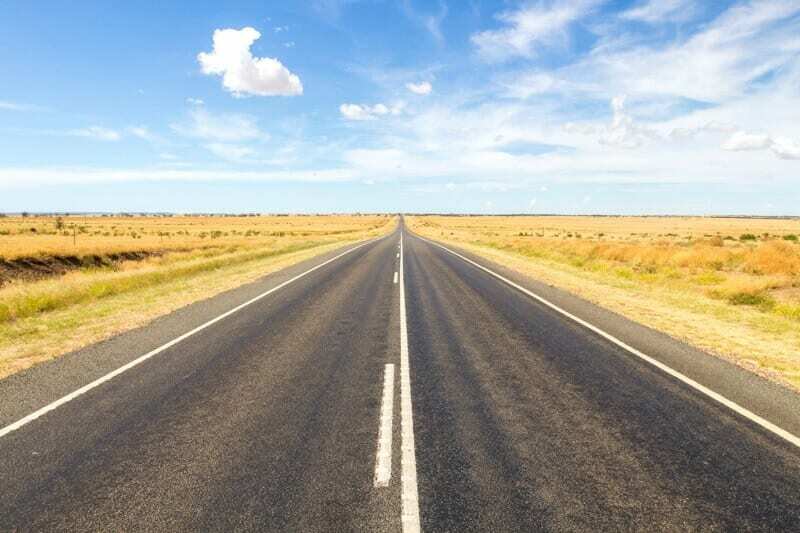 It is located 55 kilometres northwest of Longreach along the Muttaburra / Cramsey Road. It is said that the lookout itself was once used by the notorious cattle thief Harry Redford. Check road conditions! McGinness’ Restaurant – inside the Qantas Museum this casual cafe style eatery is open 7 days for breakfast and lunch and offers good value meals and drinks. Lazy Sheep Cafe – gourmet coffee and healthy modern cuisine with a funky vibe. RSL – family friendly and value for money. Don’t forget you get a campfire dinner on the Starlight’s Cruise and a roast dinner at the Outback Stockman’s Show. 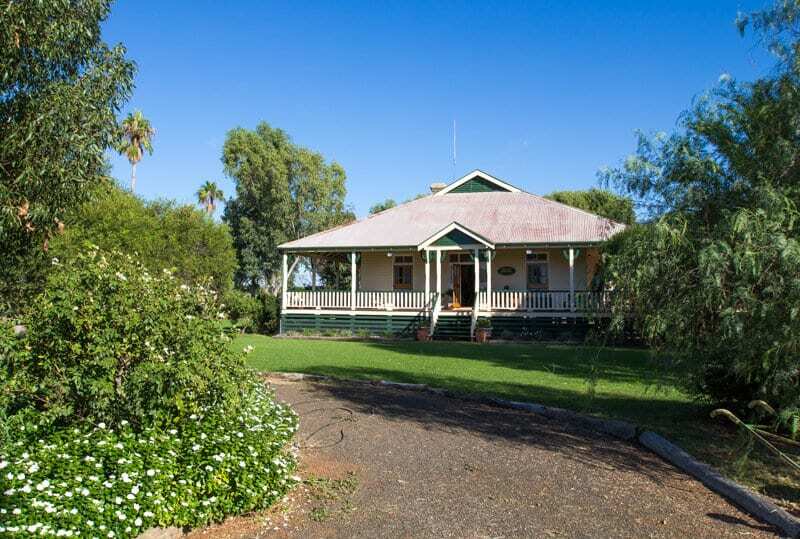 The Longreach Motor Inn is situated in the heart of Longreach just 200m from the town post office in the main street and opposite the historic LongreachRailway Station. Last but certainly not least is our favourite Outback Queensland town, Winton, just a 180kms up the road from Longreach. Winton is where dinosaurs once roamed the earth and Banjo Paterson holds pride of place. 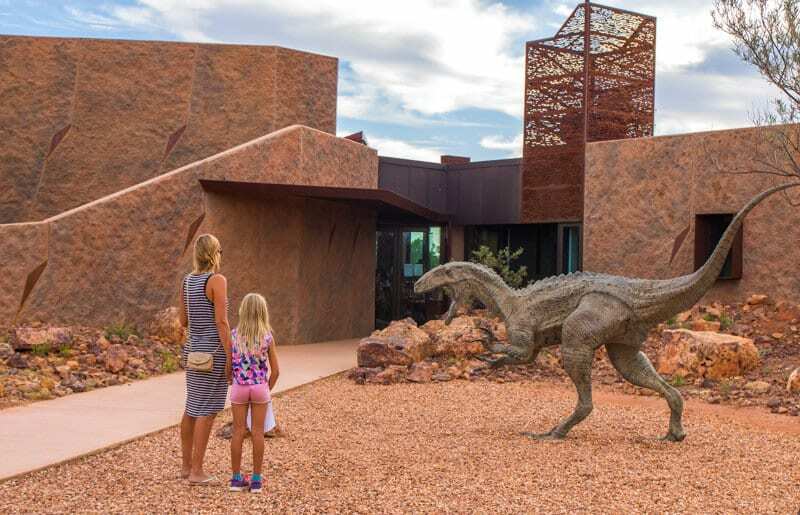 The Australian Age of Dinosaurs is home to the world’s largest collection of Australian dinosaur fossils, and this working museum and lab is a fascinating place to learn about the history of dinosaurs in Australia. 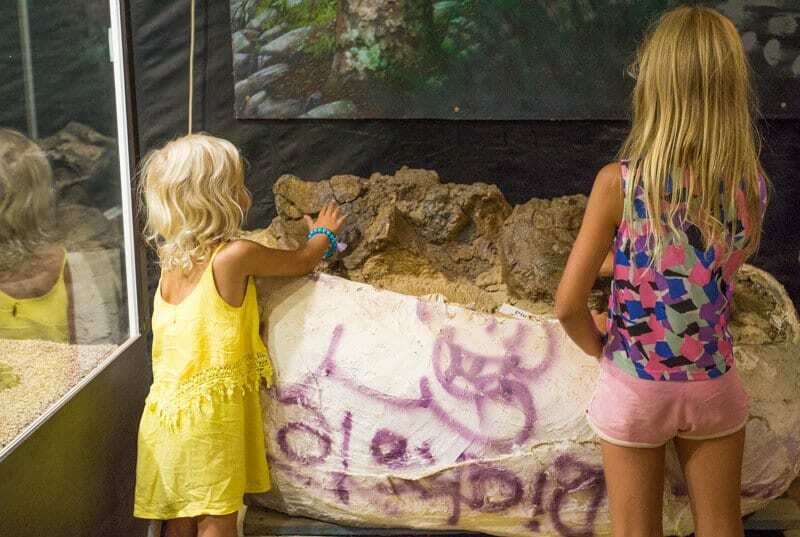 Our kids and us big kids enjoyed going behind the scenes and witnessing dinosaur bones, millions of years old. If you’re really into dinosaurs, you can prepare a real dinosaur bone in their Prep Lab, or book in to be part of a real dinosaur dig. So cool that we have this history in Outback Queensland. Your kids will love it too. Once you’re done learning about the dinosaur history, take in the views. The other awesome thing about this museum is its location, on top of a jump up (a spectacular mesa plateau) with views over where dinosaurs used to roam the land. I love this family photo of all four of us. This is why we travel, to accumulate family memories and moments! 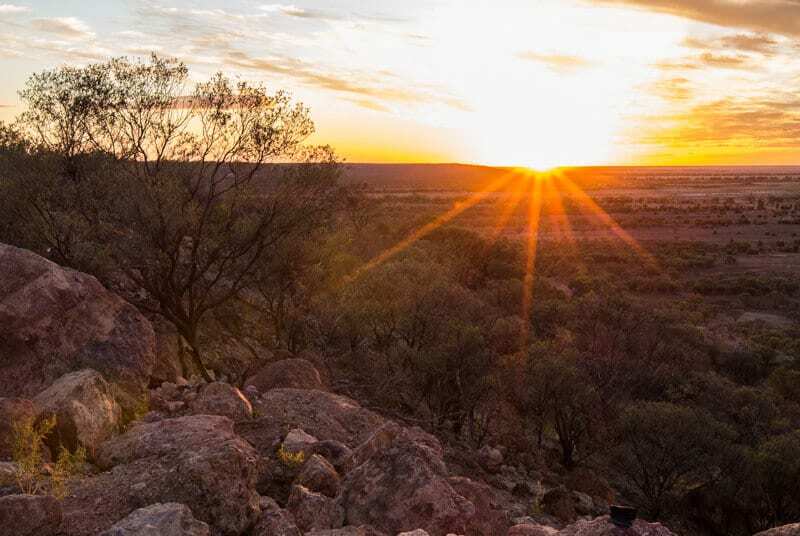 If you visit the dinosaur museum late in the afternoon like us, just outside the entrance gate is a section you can pull off to the side of the road and take in a classic Winton sunset from on top of the jump up. 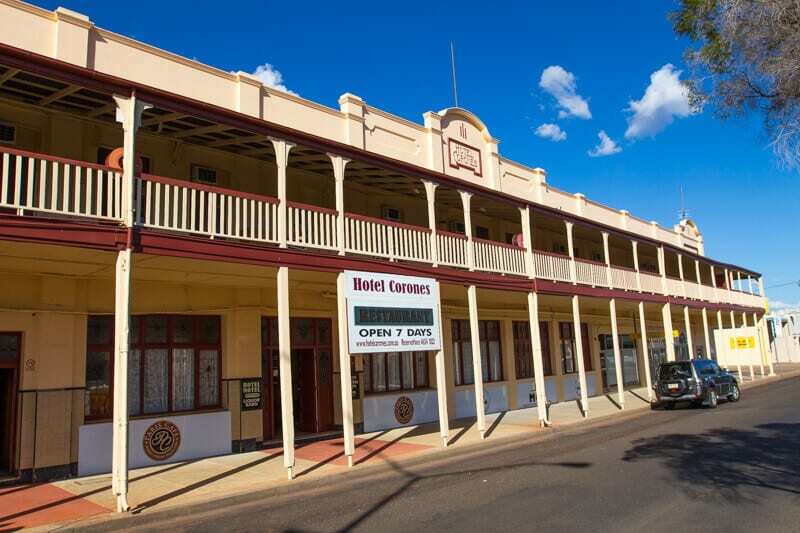 Winton is the place where Banjo Patterson wrote and first performed Australia’s unofficial National Anthem, Waltzing Matilda, at the North Gregory Hotel in town. 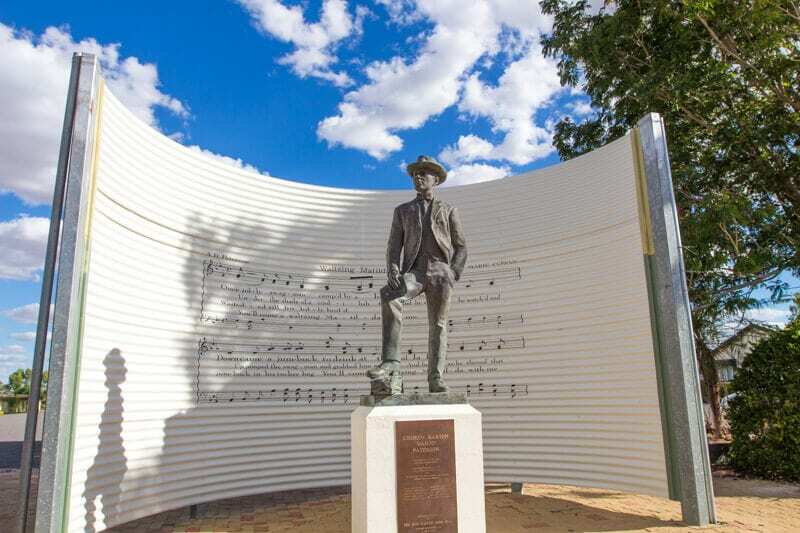 The Banjo Paterson Statue in the main street is worth a look. It’s right in front of where the old Waltzing Matilda Centre used to stand before it unfortunately burnt down – good news, a new centre is due to open around September 2017. And if you walk into the North Gregory Hotel, there’s a piano in the foyer where they claim “this is the spot” that Waltzing Matilda was first performed. Imagine a standard wire fence with added acoustic resonators that amplify any sound in the wires, caused either by striking or by wind action. And throw in other instruments created from all sorts of things and this place is a unique spot for a jamming session. None of us could hold a note too well, but Savannah rocked out on the drum kit. Gotye, the famous musician behind “Somebody that I used to know”, got a lot of inspiration from the musical fence! Before he was well known, he pulled up in town in his touring van and visited the fence to jam out and record some interesting tunes, which you now hear in his interesting music! Another interesting work of art, Arno Grotjahn’s wall surrounding his house contains almost every household item you can imagine. 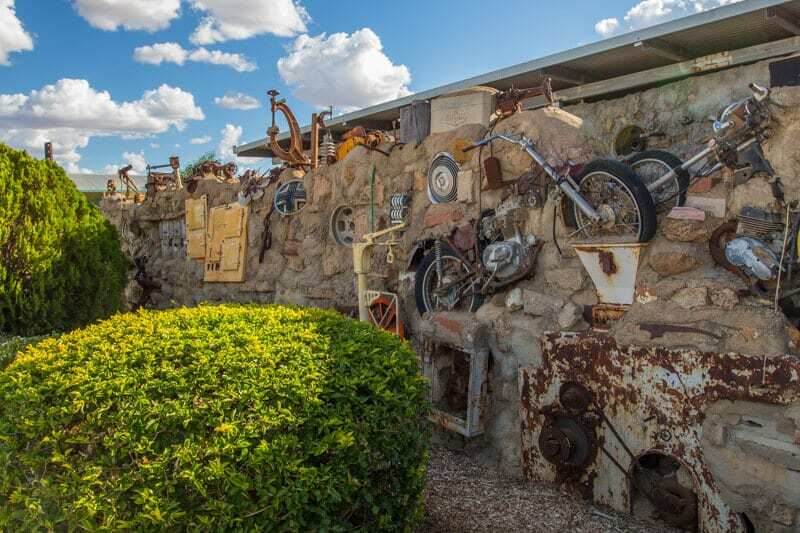 The walls reach two metres high and are constructed of concrete and studded with rusted lawn mower parts, boat propellers, vintage typewriters and sewing machines and even a couple of complete motorbikes. 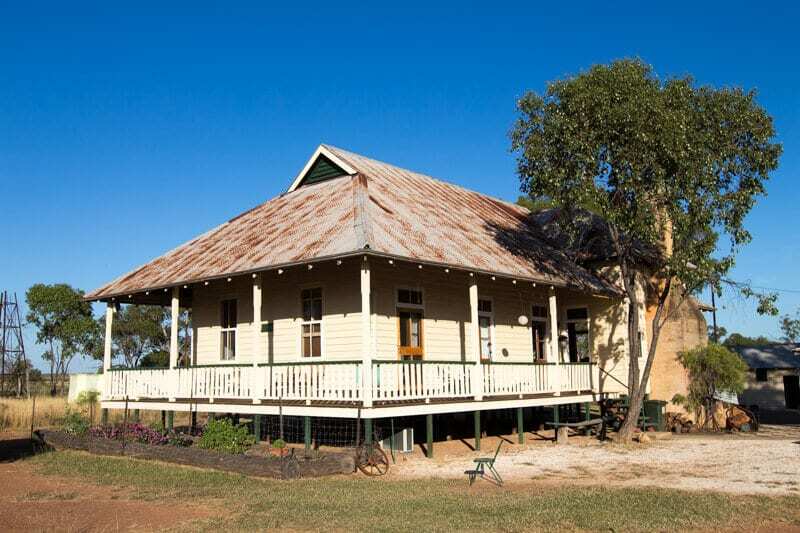 Take a look inside the Old Homestead that’s been restored and is used as an information centre and ranger office, then take a drive out to Scrammy’s Lookout and the Gorge. 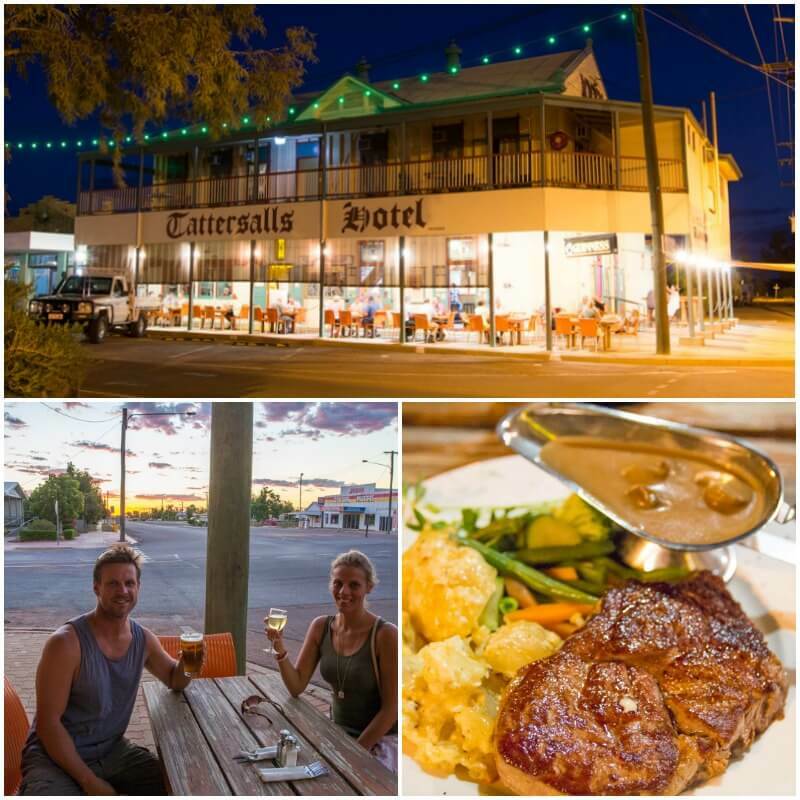 Tattersalls Hotel – one of our favourite Outback pub experiences is enjoying a few cold beers and pub grub at the Tatts! A real country pub where you can sit around the bar and have a yarn with the locals, or sit outside on the footpath under the verandah and watch the sun setting in the background. Musical Fence Cafe -chilled cafe with good coffee and a big breakfast. The Bakery – Another good option for brekkie and coffee. 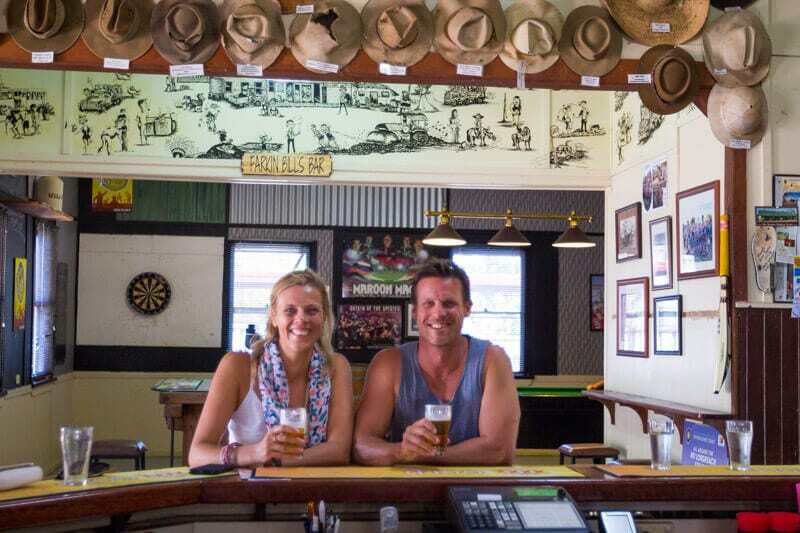 North Gregory Hotel – You can’t visit Winton without having at least one drink at the famous North Gregory. And the beer garden has a climbing wall for the kids! The famous North Gregory Hotel is in the heart of town and has become a town icon with its links to the bush and the Banjo Paterson history. They can accommodate just about anyone with ensuite rooms, hotel rooms, large family rooms available, and even a free tourist park. 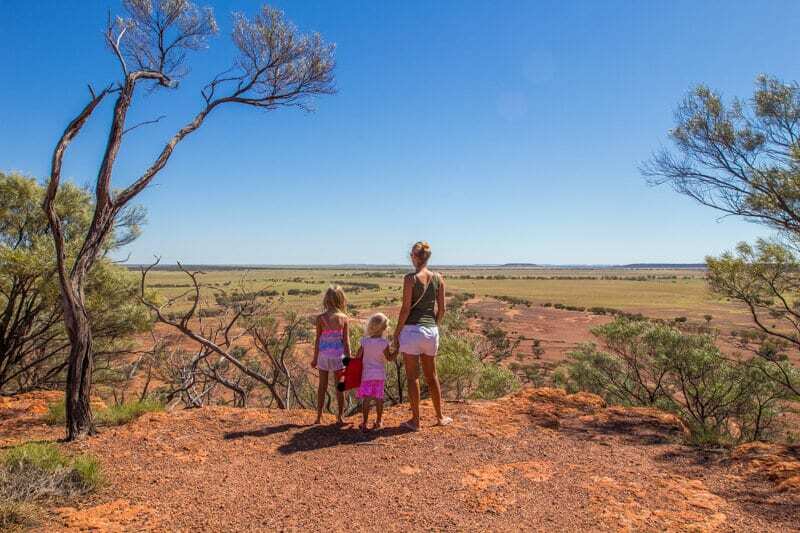 We partnered with Outback Queensland Tourism Association for this family road trip. 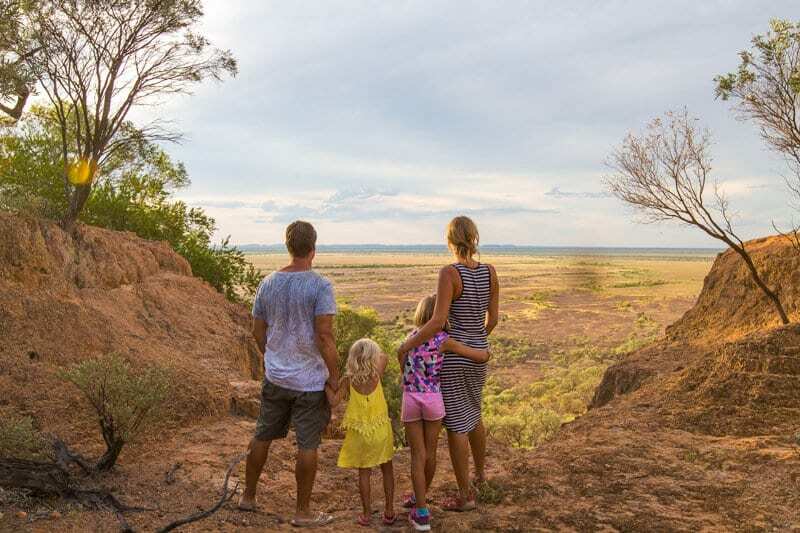 To get more informed about attractions and destinations check out their website and their family holiday deals for your trip to the Outback. Booking.com has over 60 properties in Outback. You get free cancellation on most rooms and a best price guarantee. 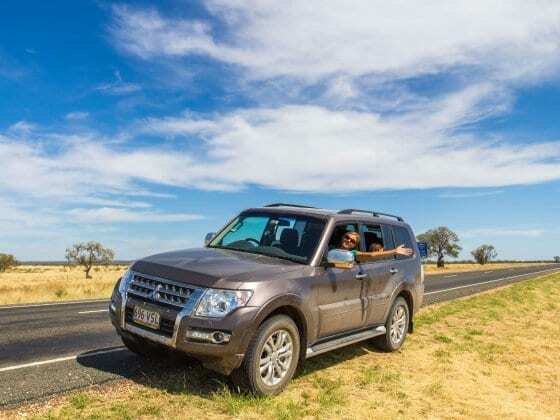 Have you done an Outback Queensland road trip before? Share any tips in the comments below! Oh gosh, guys – I’ve just added SO many things to my “Places to go” list! Especially the Australian Age of Dinosaurs (sounds amazing!) and Lara Wetlands. I can’t wait to explore the Outback 😀 Thanks for the (HUGE) list of things to check out. Glad you find it useful Phoebe. Lots more to see in Outback Queensland of course but this would be an excellent start. Hope you make it there soon! Thanks so much for the fantastic road trip..we are heading off to do this trip in June/July this year and cannot wait! Ahh, perfect timing then. Happy to hear you’ll be road tripping Outback Queensland. Enjoy!! The Qantilda Museum is open 9 till 4 each day run by volenteers is found where the Waltzing Matilda Centre was , it survived the fire and has a wonderful display of local history. Well worth a visit. Thanks for mentioning that Karen. It’s all about the memories!! Fabulous blog guys, we have so many fabulous memories of our 5 weeks trip through the Queensland outback. 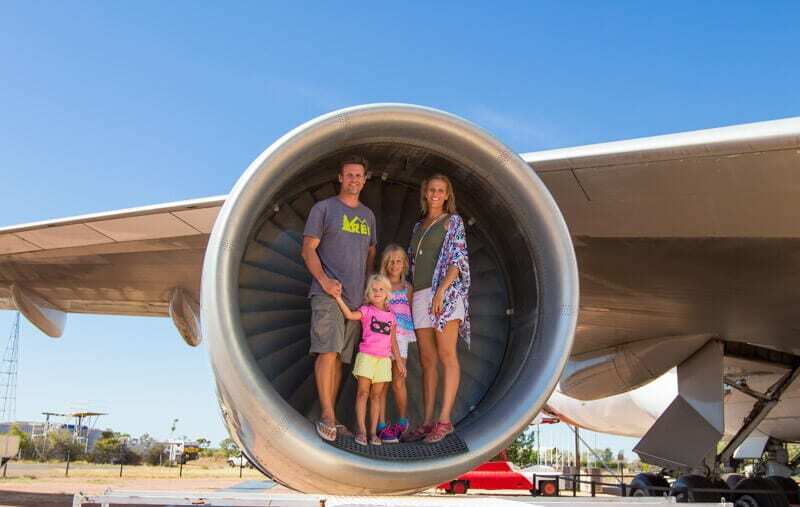 Charleville cosmos, Bladensburg national park, Quantas museum and Stockman hall of fame Longreach were some of our most memorible places to visit. Unfortunetaly we lost a lot of our photos of that trip. We still have the memories though with our 3 kids, they still talk about things we did 5 years on. Would love to do this trip but would need to hire a car and am wondering if rental car companies have any problems with renters driving in outback Queensland. Does anyone know? Our vehicle was actually a hire car from Coolangatta Airport, a Mitsubishi Pajero from Thrifty. Every road we drove on for this itinerary was bitumen besides Bladensburg NP, nothing to worry about as far as rentals go I believe. I did the exact same trip with my Grandson several years ago in my camper van. Had a blast. Love Western Queensland. Have been back the same way a couple of times since then too. Awesome to hear that Helen! The Bilby Centre (which was under construction when you came through) is now open 7 days a week with ‘Up Close & Personal’ tours 5 days a week. I just wanted to provide a more updated link. Our experiences are rare opportunities to see bilbies up close and I hope to share these moments with many people this year. Your introduction makes me want to have the trip asap. The trip will come true soon. Thanks. Glad to provide the inspiration Shelinna. Keep the dream alive! Thanks Craig, travelling in the area in June/July and after reading your blog will include several of the places and attractions mentioned. We will be travelling with our o/r caravanwith our elderly dog, so hope attractions and people are accommodating ? Hi Another fabulous post. Enthralling to read and see oooh whats next ?? Just wondering do you have to book ahead for things like the Thompson Cruise?? Thanks for a great read..
My dad and I had linvh atTattersall’s. They do the best steak sanga. It’s a lovely post with beautiful images. Looks like you had really enjoyed the trip. Thanks for the sharing your experience. The Cosmos Centre is amazing and a must do at Charleville. We looked through the telescope and saw the solar flares coming from the sun,sun spots and other amazing things. Thank you so much for posting your trip. I moved to the Gold Coast nearly two years ago from Canberra and am really wanting to check out this big wide state. I hadn’t had a clue about where to start and what to see….you have made it incredibly easy and exciting. ….thank you am very grateful. Lovely photos and information sadly you missed out on seeing the miles museum it would have been one of your highlights . Everything about your trip looks absolutely delightful! Hey Guys! Looks like you had an outstanding trip! Next time, if you’re looking to head north of Roma, we’d love to have you come on tour with us (from Roma) to experience Carnarvon Range on our day tour. There’s some very cool photo opportunities there. Or even learn more about the gas fields and agriculture on our Wheat, Wells and Wildlife tour. Appreciate the offer Elizah. Carnarvon Gorge is beautiful.